The many festivals in North East India highlight the region's rich indigenous culture with folk songs, tribal dances, food, and crafts. Nagaland, which shares a border with Myanmar, has really embraced the concept of tourism. The Hornbill Festival is perhaps the most famous and largest of the North East India festivals, and it's certainly Nagaland's huge draw card. Named after the state's most admired bird, the festival showcases the heritage of the 16 tribes there, which in addition to dancing show off their hunting and waring skills. Over the years, the Hornbill Festival has grown to encompass the Hornbill National Rock Concert, which attracts bands from all over India to compete, and a night market. An iconic outdoor music festival in one of India's most remote and picturesque locations (think lush paddy fields and pine clad mountains), Ziro features a combination of 30 indie bands from across the world and top folk acts from across northeast India. It's one of the greatest outdoor music festivals in the country! Camping facilities are provided. Most famous for its tea gardens and rare Great Indian One-Horned Rhinoceros, Assam also has three major cultural festivals a year, all known as Bihu, that mark a particular period on the agricultural calendar. The biggest and most colorful of the three is Bohaag Bihu (also known as Rongali Bihu), which is celebrated at seeding time in spring with plenty of singing and dancing. It also marks the start of the new year there. The first day is dedicated to the cows, which are vital to agriculture. The second day is spent visiting friends and relatives, along with plenty of singing and dancing. On the third day, deities are worshiped. Kaati Bihu, at the completion of paddy transplanting, is a relatively solemn occasion involving the lighting of lamps to guide souls to heaven. The end of the harvest season is marked by Maagh Bihu (also known as Bhogali Bihu), with bonfires feasting, buffalo fights, and pot breaking. When: Bohaag/Rongali Bihu (mid-April each year), Kaati Bihu (mid-October each year), and Maagh/Bhogali Bihu (mid-January each year). Where: The Assam Tourism Department organizes a special Rongali Utsav at Srimanta Sankardeva Kalakshetra, Guwahati. If you're in Assam for Maagh/Bhogali Bihu, time your visit to coincide with the Brahmaputra Beach Festival, organized by the Assam Boat Racing and Rowing Association. This two-day event combines culture and adventure sports, including traditional Bihu dances, food, crafts, cultural exhibition, paragliding, boat cruises, canoeing, rafting, and beach volleyball. It's a great way to enjoy the outdoors! It's held on the Brahmaputra river banks (entrance from Sonaram field, Bharalu, overlooking Umananda island). Another Assamese festival, organized by the Tourism Department around the time of Maagh/Bhogali Bihu, that's worth catching is the Dehing Patkai Festival. Named after the Dehing river and Patkai range in eastern Assam, it offers something for everyone. Attractions include fairs, tea heritage tours, golfing, adventure sports, hiking and wildlife, and trips to Stilwell Road and World War II cemeteries. For a traditional tribal festival off the beaten track, don't miss the month-long Myoko festival of the Apatani Tribe. The festival is celebrated among three communities in Ziro -- Diibo-Hija, Hari-Bulla, and Hong of Apatani plateau -- on a rotational basis. It includes rituals for prosperity, fertility, purification, and sacrifice performed by the village shaman or priest, and many interesting cultural elements such as folk performances and processions. The shaman is the most important figure in the community. At dawn on the second day of the festival, each clan in the village collects pigs to be sacrificed. The shamans recite sacred prayers and mantras while women sprinkle the pigs with flour and rice beer. Afterward, they're taken to the huts of their owners to be sacrificed. The Wangala Festival is the biggest harvest festival of the Garo tribe in Meghalaya. Held in honor of the Sun God of fertility, the festival marks the end of the sowing season and agricultural year. It's celebrated by the beating of drums, blowing horns, and traditional dancing. The highlight is the sound of 100 drums (nagaras) being beaten together. Hence, the alternative name for the festival -- the 100 Drum Wangala Festival. Other attractions include a traditional dance competition, slow-cooking competition, indigenous games, and handloom and handicrafts exhibition. Once deadly headhunters, the fascinating Konyak tribe now lives peacefully, spending most of their time practicing agriculture, drinking local alcohol, smoking opium (and occasionally hunting). After having completed the sowing of seeds each year, the tribe celebrates their most important festival, the Aoling Festival, which marks the beginning of ​the spring season and a new year. Mopin is the harvest festival of the hospitable Galo tribe, focused on the worship of goddess Mopin. It's celebrated to drive away evil spirits, and for acquiring prosperity and wealth. An indigenous folk dance called Popir, performed by young women, is a highlight of the festival. Traditional rice wine (apong), prepared by Galo women, is also served. Where: East Siang and West Siang districts of Arunachal Pradesh. Festivities take place on a grand scale at Mopin Ground, Naharlagun, near capital city Itanagar. Celebrated by the Ao tribes of Nagaland, the Moatsu Festival is a time of great rejoicing as the planting season comes to an end. All activities are associated with the harvest. You can expect a lot of singing, dancing, and merry-making at this festival. The highlight of the occasion is Sangpangtu. Men and women dress up in their best attire and sit around a fire, eating meat and wine. Dree is an agricultural festival of the Apatani tribe. It's celebrated by sacrificial offerings and prayers to the gods who protect the crops. Folk songs, traditional dances, and other cultural performances have also become a part of the modern-day festivities. There's even a "Mr Dree" contest, billed as the ultimate platform for men to show their strength, agility, stamina, and intelligence. 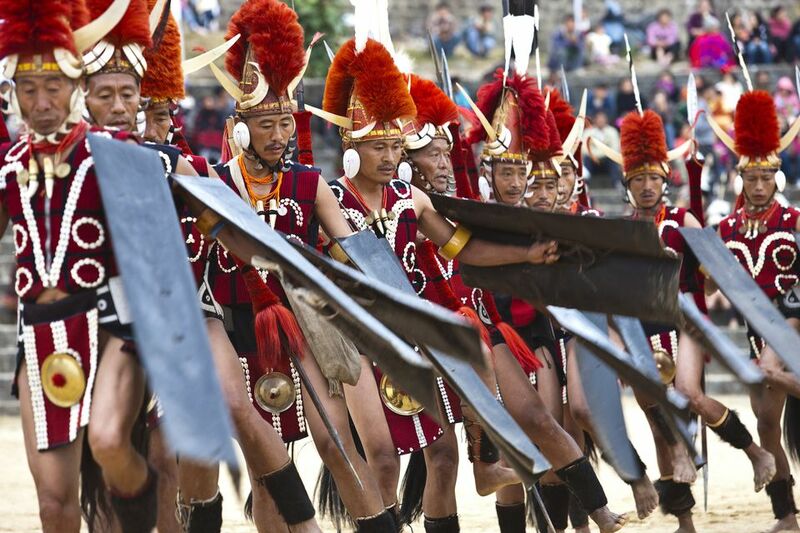 A three-day monastery festival, Torgya is observed by the Monpa tribe of Arunachal Pradesh. 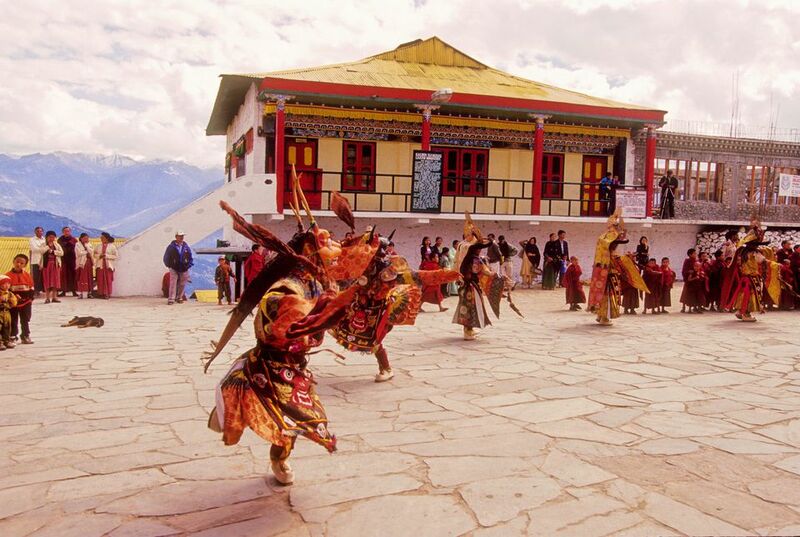 The rituals, including the performance of sacred dances by brightly costumed monks in the monastery's courtyard, are supposed to ward off evil spirits and bring prosperity to the tribe. When: Late January each year. The celebrations are the grandest every third year known as Dungyur Chenmo (the last one was in 2016). The annual Nongkrem Dance Festival is a five-day harvest thanksgiving festival of the Khasi tribe. The traditional dance is performed by young men and women dressed up in exquisite attire. If you're a vegetarian or animal lover, be aware that an important feature of the festival is the 'Pomblang' or goat sacrifice, which you will most likely want to avoid. The Nongkrem dance is a part of the religious festival of Meghalaya, where unmarried girls decked with gorgeous attire, gold and silver ornaments, and yellow flowers, dance forward and backward forming a circle. A usual Tantric fertility festival, the Ambubachi Mela marks the menstruation period of the Goddess Kamakhya. Her temple is closed for three days while she menstruates and reopens on the fourth day, with a rush of devotees who come to receive bits of cloth that are supposedly soaked with her menstrual fluid. It's considered to be extremely auspicious and powerful. The festival attracts numerous Tantric sadhus (holy men) from India and abroad. Some of them only appear in public during the four days of the festival. They perform unique rituals and exercises that are widely photographed. The festival is also popular for its rural crafts fair. Chapchar Kut is a harvest festival named after the bamboo that has been cut and is drying for burning and subsequent cultivation. The traditional bamboo dance performed by women (while men sit on the ground and beat bamboo sticks against each other), called cheraw, is a big part of the festival. Different styles of tribal dance performances take place amidst symbol clashes and beats of drums. There's art, handicrafts, concerts, flower shows, and food as well.